Chinese mythology is a collection of cultural history, folktales, and religious tradition that has been passed down for centuries in oral or written form. There are several aspects to Chinese mythology, including creation myths and legends, and myths concerning the founding of Chinese culture and the Chinese state. Chinese mythology generally concerns moral issues and informs people about their culture and values. Like many mythologies, some people believe it to be at least in part a factual recording of history. Chinese myths are thought to have originated around the twelfth century B.C.E., and were transmitted orally for over one thousand years before being recorded in books such as Shui Jing Zhu and Shan Hai Jing. These early works are the sources for the myths which are extant today. There has been extensive interaction between Chinese mythology and the major belief systems of Confucianism, Taoism, and Buddhism. Elements of pre-existing mythology were adapted into these belief systems, and some of the teachings and beliefs of these systems also became incorporated into Chinese mythology. For example, the Taoist belief in a spiritual paradise became incorporated into mythology, as the place where immortals and deities dwell. The myths glorifying the benevolent rulers of the past, the Three August Ones and Five Emperors became a part of the Confucian political philosophy. Historians have conjectured that much of Chinese mythology originated in the twelfth century B.C.E.. The myths and the legends were passed down orally for over a thousand years, before being written down in early books such as Shui Jing Zhu and Shan Hai Jing. Other myths continued to be transmitted through oral traditions such as theater, dance, and song, before being recorded in the form of novels such as Fengshen Yanyi. Most of the myths extant today are derived from these works. Shan Hai Jing (Mountain and Sea Scroll) describes the myths, witchcraft, and religion of ancient China in great detail and also has a record of the geography, sea and mountains, history, medicine, customs, and ethnicities of ancient times. It has been called an early encyclopedia of China. In Wu Chinese, "talking about the Shan Hai Jing" is an idiom meaning gossip or idle chat. Shui Jing Zhu (Commentaries on the Water Scroll) began as commentaries on the briefer work of the Water Scroll, but became famous of its own accord because of its extensive record of geography, history, and associated legends. Hei'an Zhuan (Epic of Darkness) is the only collection of legends in epic form preserved by a community of the Han ethnicity of China, the inhabitants of the Shennongjia mountain area in Hubei, and contains accounts from the birth of Pangu until the historical era. Imperial historical documents and philosophical canons such as Shangshu, Shiji, Liji, Lushi Chunqiu, and others contain information about the foundation of China and the legendary emperors and heroes who established the Chinese nation and culture . Verse poetry of ancient states such as Lisao by Qu Yuan of the Chu state. Fengshen Yanyi (封神演義), or Anointing of the Gods, mythological fiction dealing with the founding of the Zhou dynasty. Journey to the West, by Wu Cheng'en, a fictionalized account of the pilgrimage of Xuanzang to India, in which the pilgrims encountered a variety of ghosts, monsters, and demons. Baishe Zhuan, a romantic tale set in Hangzhou involving a snake who attained human form and fell in love with a man. Nuwa and Fuxi represented as half-snake, half-human creatures. A unique characteristic of Chinese culture is the relatively late appearance in Chinese literature of creation myths. Those that do exist appear well after the foundation of Confucianism, Taoism, and folk religions. The stories exist in several, often conflicting, versions, with the creation of the first humans variously ascribed to Shangdi, Heaven, Nuwa, Pangu, and Yu Huang. Shangdi (上帝), appeared in literature probably about 700 B.C.E., or earlier (the dating of these occurrences depends on the date of the Shujing ("Book of History"). No specific "creation" narratives were associated Shangdi, although he could be interpreted in the role of a creator. Shangdi appears to have the attributes of a "person;" detailed references to Shangdi as the creator are not explicitly identified until about the Han Dynasty (206 B.C.E. – 222 C.E.). Tian (天, or Heaven), appeared in literature probably around 700 B.C.E., or earlier (the dating of these occurrences depends on the date of the Shujing, aka "Book of History"). There are no specific "creation" narratives for "Heaven" either, although the role of a creator is a possible interpretation. The qualities of 'Heaven' and Shangdi appear to merge in later literature (and they are worshipped as one entity ("皇天上帝") in, for example, the Temple of Heaven in Beijing). The extent of the distinction (if any) between them is debated. Nüwa (女媧), who appeared in literature no earlier than about 350 B.C.E., is said to have recreated, or created the human race. 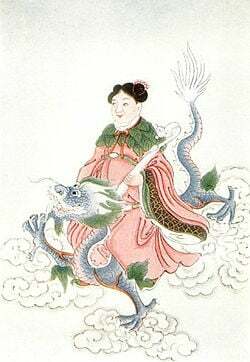 Her companion was Fuxi (伏羲), the brother and husband of Nuwa. These two beings are sometimes worshipped as the ultimate ancestor of all humankind. They are often represented as half-snake, half-human creatures. Nüwa was also responsible for repairing the sky after Gong Gong damaged the pillar supporting the heavens (see below). Pangu (盤古), who appeared in literature no earlier than about 200 C.E., was the first sentient being and creator. In the beginning there was nothing but a formless chaos. Out of this chaos there was born an egg, which remained for 18,000 years. When the forces of Yin and Yang balanced, Pangu emerged from the egg, and set about the task of creating the world. With a swing of his great axe, he separated Yin and Yang. The heavy Yin sank to become the Earth, while the light Yang rose to become the Heavens. Pangu stood between them, and pushed up the sky. At the end of eighteen thousand years, Pangu laid to rest. His breath became the wind; his voice the thunder; left eye the sun and right eye the moon; his body became the mountains and extremes of the world; his blood formed rivers; his muscles the fertile lands; his facial hair the stars and milky way; his fur the bushes and forests; his bones the valuable minerals; his bone marrows sacred diamonds; his sweat fell as rain; and the little creatures on his body (in some versions, the fleas), carried by the wind, became human beings all over the world. Yu Huang (玉皇, or Jade Emperor), including representations of him such as Yuanshi Tianzun (元始天尊), Huangtian Shangdi (皇天上帝), appear in literature well after the establishment of Taoism in China. Following the age of Nuwa and Fuxi (or contemporaneous in some versions) was the age of the Three August Ones and Five Emperors (三皇五帝), a collection of legendary rulers who ruled between c. 2850 B.C.E. and 2205 B.C.E., which is the time preceding the Xia dynasty. Fuxi (伏羲) - The companion of Nuwa. Shennong (神農) – Shennong ("Divine Farmer"), reputedly taught the ancients agriculture and medicine. Huang Di (黄帝) - Huang Di, commonly known as, the "Yellow Emperor," is often regarded as the first sovereign of the Chinese nation. Shaohao (少昊) - Leader of the Dongyi or "Eastern Barbarians"; his pyramidal tomb is in present-day Shandong province. Emperor Ku (帝嚳) - Great grandson of the Yellow Emperor; nephew of Zhuanxu. Yao (堯) - The son of Ku. His elder brother succeeded Ku, but abdicated when he was found to be an ineffective ruler. Shun (舜) - Yao passed his position to Shun instead of to Yao's own son because of Shun's ability and moral principles. These rulers were generally regarded as extremely moral and benevolent rulers, examples to be emulated by latter day kings and emperors. When Qin Shi Huang united China in 221 B.C.E., he felt that his achievements had surpassed those of all the rulers who had gone before him. He combined the ancient tiles of Huang (皇) and Di (帝) to create a new title, Huangdi (皇帝), usually translated as Emperor. Shunchose Yu the Great (禹)to succeed him as leader of the Huaxia tribe. According to legend, the Yellow River was prone to flooding, and erupted in a huge flood in the time of Yao. Yu's father, Gun, was put in charge of flood control by Yao, but failed to alleviate the problem after nine years. He was executed by Shun, and Yu took his father's place, leading the people in building canals and levees. After 13 years of toil, the flooding problems were solved. Shun enfeoffed Yu in Xia, in present-day Wan County in Henan. On his death, Shun passed the leadership to Yu. The main source for the story of Yu and the Great Flood comes from The Counsels of Yu the Great in the Classic of History (尚書•大禹謨). Because of his achievement in resolving the Great Flood, Yu, alone among the mythological rulers, is usually called "Yu the Great" (大禹). Alternatively, he is called Emperor Yu (帝禹), like his predecessors. Upon Yu's death, his position as leader was not passed on to his deputy, but was inherited by his son Qi. Various sources differ as to the process by which Qi rose to this position. Most versions agree that during his lifetime, Yu had designated his deputy, Gaotao (皋陶), to be his successor. When Gaotao died before him, Yu then selected Gaotao's son, Boyi (伯益) as successor. One version then says that all the peoples who had submitted to Yu admired Qi more than Boyi, and Yu passed power to Qi instead. Another version holds that Boyi ceremoniously offered the position to Qi, who accepted, against convention, because he had the support of other leaders. A third version says that Qi killed Boyi and usurped his position as leader. In any case, Qi's succession broke the previous convention of meritorious succession, and began what is traditionally regarded as the first dynasty in Chinese history. The dynasty is called "Xia" after Yu's centre of power. The Xia Dynasty is considered at least semi-mythological. The Records of the Grand Historian and the Bamboo Annals record the names of 17 kings of the Xia Dynasty. However, there is no conclusive archaeological evidence of its capital or its existence as a state of any significant size. Archaeological evidence does not point towards a significant urban civilization until the Shang Dynasty. Jie, the last king of the Xia Dynasty, is said to have been a bloodthirsty despot. Tang of Shang, a tribal leader, revolted against Xia rule and eventually overthrew Jie and established the Shang Dynasty, based in Anyang. The Shang Dynasty ruled from ca. 1766 B.C.E. to ca. 1050 B.C.E.. It came to an end when the last despotic ruler, Zhou of Shang, was overthrown by the new Zhou Dynasty. The end of the Shang Dynasty and the establishment of the Zhou is the subject of the influential mythological fiction, Investiture of the Gods (封神演義). "Nine Dragons" handscroll section, by Chen Rong, 1244 C.E., Chinese Song Dynasty, Museum of Fine Arts, Boston. The Jade Emperor is believed to be the most important god. The origins of the Jade Emperor and how he came to be regarded as a deity are unknown. Also known as Yu Huang Shang-ti, his name means “the August Personage of Jade.” He is considered to be the first god and to be in charge of all the gods and goddesses. Many myths about well-known gods and goddesses who were in charge of different aspects of culture exist, but all of them were subordinate to the Jade Emperor. The Chinese dragon is one of the most important mythical creatures in Chinese mythology. The Chinese dragon is considered to be the most powerful and divine creature and is believed to be the controller of all waters. The dragon symbolized great power and was very supportive of heroes and gods. One of the most famous dragons in Chinese mythology is Ying Long, or "Responding Dragon." He is said to be the god of rain. Many people in different places pray to him in order to receive rain. In Chinese mythology, dragons are believed to be able to create clouds with their breath. Chinese people often use the term "Descendants of the Dragon" as a sign of ethnic identity. There has been extensive interaction between Chinese mythology and the major belief systems of Confucianism, Taoism, and Buddhism. Elements of pre-existing mythology were adapted into these belief systems as they developed (in the case of Taoism), or were assimilated into Chinese culture (in the case of Buddhism). Elements from the teachings and beliefs of these systems also became incorporated into Chinese mythology. For example, the Taoist belief in a spiritual paradise became incorporated into mythology, as the place where immortals and deities dwell. The myths glorifying the benevolent rulers of the past, the Three August Ones and Five Emperors became a part of the Confucian political philosophy. Xuan Nü (玄女) goddess who assisted Huang Di (黃帝) to subdue Chi You (蚩尤). Dizang (地藏菩薩), rescuer of the dead. Yanluo (閻羅) ruler of Hell (short from 閻魔羅社 Sanskrit Yama Raja). Guan Yu (關聖帝君), God of Brotherhoods. God of martial power. Also revered as God of War in that time. Zhao Gongming (趙公明), God of Wealth; Rides on a Tiger. Bi Gan (比干), also God of Wealth. Zao Jun (灶君)popular god(s) of the Kitchen. 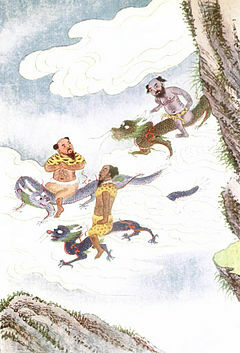 Zhong Kui (鍾馗) or Jung Kwae mythical person reputed for subjugating demons. Zhu Rong (祝融): God of fire. Defeated Gong Gong. Gong Gong (共工): God of water, during the fight with God of Fire, he crushed Mount Buzhou, broke the sky, which was then patched by Nuwa. Chi You (蚩尤 chi1 you2): War god. Inventor of metal weapons. Nemesis of Huang Di. Cangjie (倉頡): Cangjie creates the Chinese characters. Chang E (嫦娥) Hou Yi's wife. Goddess of the Moon. The Cowherd and Weaver Girl (牛郎織女）. Han Ba (旱魃), Ancient goddess of drought. Gao Yao: God of justice and judgment. Jian (鶼) A mythical bird supposed to have only one eye and one wing: 鶼鶼 a pair of such birds dependent on each other, inseparable, hence, represent husband and wife. Jingwei (精衛) a mythical bird which tries to fill up the ocean with twigs and pebbles. Nine-headed Bird Used to scare children. Su Shuang (鷫鵊) a mythical bird, also variously described as a water bird, like the crane. Peng (鵬, a mythical bird of giant size and terrific flying power) Also known as Chinese roc. Qing Niao (青鳥) a mythical bird, the messenger of Xi Wangmu. Li (hornless dragon), lesser dragon of the seas. Is hornless. Jiaolong, a dragon of floods and the sea. Qilin, chimeric animal with several variations. The first giraffe sent as a gift to a Chinese emperor was believed to be the Qilin. An early Chinese painting depicts this giraffe replete with the fish scales of the Qilin. Long Ma (龍馬) Similar to the Qilin- the dragon-horse. Kui (夔) a mythical one legged monster. Kun, also known as Peng (鯤) a mythical giant monstrous fish. Tao Tie (饕餮) a mythical gargoyle-like figure, often found on ancient bronze vessels, representing greed. It is said to be the fifth son of dragon and has such an appetite that it even eats its head. Xiao (魈) A mythical mountain spirit or demon. The Xing Tian (刑天 "punished one" or "he who was punished by heaven") is a headless giant. He was decapitated by the Yellow Emperor as punishment for challenging him. Because he has no head, his face is in his torso. He wanders around fields and roads and is often depicted carrying a shield and an axe and doing a fierce war dance. Xuanpu (玄圃), a mythical fairyland on Kunlun Mountain (崑崙). Yaochi (瑤池), abode of immortals where Xi Wang Mu lives. Fusang (扶桑), a mythical island, often interpreted as Japan. Queqiao (鵲橋) the bridge formed by birds across the Milky Way. Penglai (蓬萊) the paradise, a fabled Fairy Isle on the China Sea. Longmen (龍門) the dragon gate, where a carp can transform into a dragon. Many Chinese myths online – Crystal Dragon of Taiwan.